The Union of Comoros is located in southern Africa, group of islands in Indian Ocean, at the northern mouth of the Mozambique Channel, about two-thirds of the way between northern Madagascar and northern Mozambique. 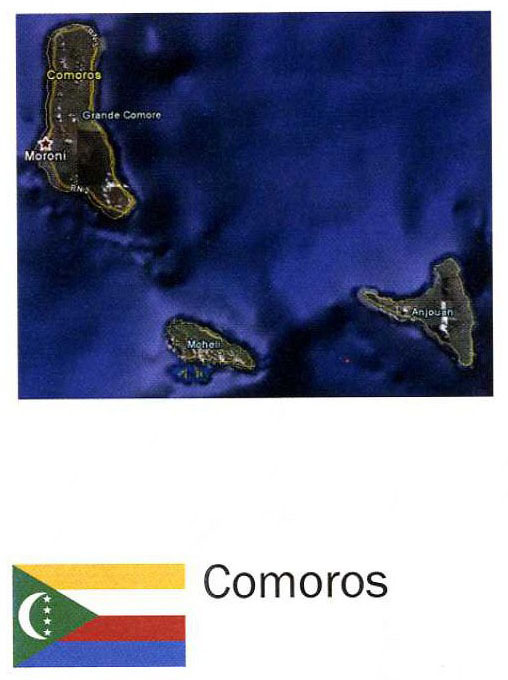 The Comoros has a total area of 2,170 sq km with a population of 671,247 (July 2005 est.). The Climate is tropical marine with rainy season from November to May. The terrain is volcanic islands with interiors vary from steep mountains to low hills. The extreme elevations vary between 0 m and 2,360 m at Le Kartala. The Capital of the Comoros is Moroni.